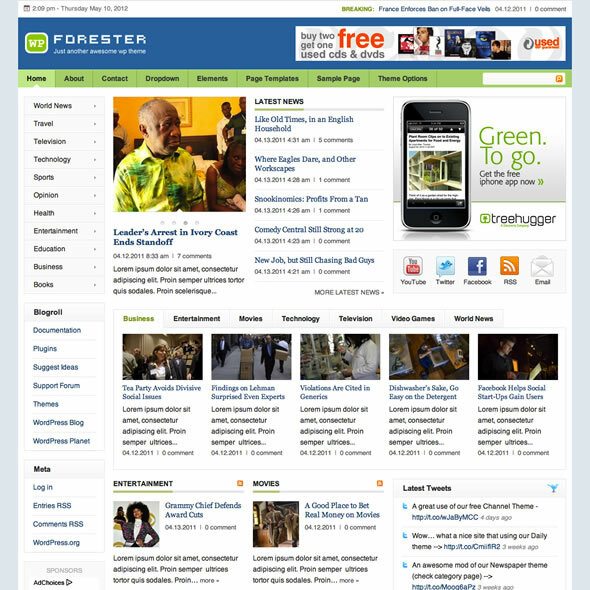 Forester WordPress theme is one of the most coolest and smart looking themes. Majority of website designers like to use this theme on majority of their projects. This theme best fits media websites like news, magazine, fashion, entertainment and other websites. Even though this theme is best on media sites, it does not meanyou cannot apply it on yoursite, which does not relate to media. Every web designer and developer will agree that creativity is the number one priority when it comes to creating a website. Therefore, you can use this theme and work on it through the control panel to customize it. This way, you will have the ability to play around with the customization until you get that unique customized theme. Remember that this theme is free for everyone to use. Forester is a premium WordPress magazine theme created by ThemeJunkie. The theme is regularly updated to keep it bug free. The theme has been tested and it is compatible with all major browsers like internet explorer, Firefox, Google chrome, safari, operamini and others. 1. The free version: the free version is available to everyone. This version is the best for bloggers. 2. The standard version: this version is the best for personal projects. You can also apply this theme on your website or blog. The version is bought at an affordable price, which is $29.95. 3. The developer version: this version is the best for client projects and personal projects.